Our company exists for one reason, and one reason only: To Give You What You Want In a Sports Vacation. Our experience as avid sports fans, and sports vacationers is why we started this company. We want you to have a great time, and we want you to do it at the same value we’ve found for ourselves. A recent example will hammer this point home a little more. 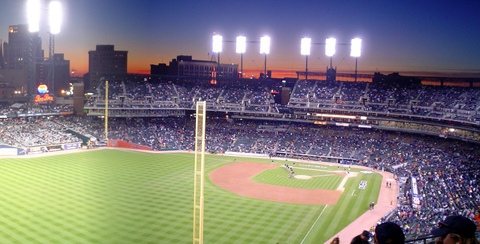 A client came to us wanting to surprise her husband with a weekend in Detroit to see his favorite team, the Detroit Tigers. We discussed ticket locations, other plans she had, and decided on a great pair of tickets down the 1st base line, and 3 nights in a luxury 4-star hotel in downtown Detroit, at a very nice price. The point of this story isn’t necessarily the end result, but how we got there. When we build our quotes, we start from scratch each and every time. We don’t have static packages. We keep everything fresh (think of us like the restaurant where everything is made to order and other companies use stale packages that have been kept under a heat lamp for hours). We pride ourselves on this, and believe it is important, because the market can fluctuate. Many sports vacations are pre-packed months before the event, at prices that aren’t close to what you should be paying. By staying current, you’re getting the best deal possible on the sports vacation you really want. When planning your next sports vacation, contact us. We will treat you right, because we treat each and every sports vacation like we are coming with you. (We aren’t coming with, because that might get awkward). If we wouldn’t like the tickets, or the hotel, we sure aren’t going to stick you with them just to make a buck. Also, you can be sure you are getting the best and most current price.